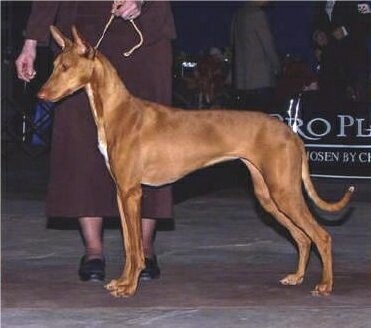 The Pharaoh Hound is a tall, slender, athletic sighthound. The length of the body is slightly longer than it is tall. The neck is long and lean, slightly arched. The head is wedge-shaped and chiseled. The muzzle is slightly longer than the flat skull and has a slight stop. The nose is almost the same color as the coat. The teeth meet in a scissors bite. The small, oval eyes are moderately deep set, and amber in color. The large ears are medium-high-set, erect and are broad at the base. The long, whip-like tail is medium set, thicker at the base and tapering. The front legs are straight. Dewclaws are sometimes removed. The short, glossy, fine to close coat comes in red or tan, often with white markings. Show ring judges prefer white on the tip of the tail. The Pharaoh Hound is reasonably independent and a most pleasant companion dog. It is peaceful in the house and loves to play outdoors. It will be calm provided it receives enough exercise. Loyal, brave and loving, this quiet dog is naturally well-behaved and intelligent. It loves children, but is reserved with strangers. A truly unique trait of this breed is when it is excited it "blushes," turning a glowing deep rose on its nose and ears. The Pharaoh Hound should not be too difficult to train. The handler needs to be understanding of the dog's character and to be consistent in approach. It can do well in competitive obedience. Socialize the Pharaoh well at an early age and as the owner of the dog, be sure to stay mentally strong so the dog can feed from your energy to avoid timidity. Nervous humans tend to have nervous dogs because the dog can feel your emotions. 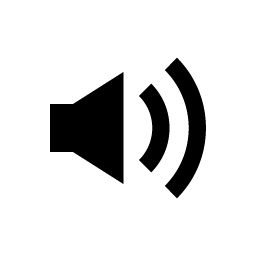 Generally good with other dogs, but can be rather dominant toward other male dogs if the owners are not there to communicate to the dog that dominance is an unwanted behavior. This breed likes to chase and it is very fast. A speedy hunter, it should not be trusted with pet mice, rats, guinea pigs, rabbits, cats and other small non-canine pets. Do not take it off the leash unless you are in a safely contained area, because if it spots a rabbit it will be gone. The Pharaoh Hound needs an owner who is calm, displaying a confident, consistent, natural authority over him. The rules must be made clear in such a way that the dog can understand. This is a very healthy and hardy breed; but beware, the Pharaoh can be highly sensitive to insecticides and medicines. The Pharaoh Hound will be okay in an apartment if sufficiently exercised. It is relatively inactive indoors and will do best with at least a large yard. It needs soft bedding and warmth and generally should not be expected to sleep outside except in warm climates...but it would still prefer to sleep with its family. This breed likes to chase things and should not be let off the leash unless it is in a safe area. It can go far away from you if it spies or scents wild game because it never loses its instinct to hunt alone. To prevent this you will need a secure, high fence around your yard. This breed can jump very high to get out of a space. The Pharaoh Hound relishes the opportunity to stretch its legs in a safe area—with frequent long runs. Try to set aside an hour each day to bicycle while the dog runs alongside you on a leash, although it can manage with a long daily walk on the leash and occasional sprints. While out on the walk the dog must be made to heel beside or behind the person holding the lead, as in a dog's mind the leader leads the way, and that leader needs to be the human. The Pharaoh Hound needs little grooming. It is only necessary to remove dead and loose hair with a rubber brush. Bathe or dry shampoo only when necessary. The Pharaoh Hound is a relatively clean dog with no doggy odor. This breed is an average shedder. The Pharaoh Hound is one of the oldest domesticated dog breeds in the world. The breed is estimated to have originated around 4000 to 3000 BC. The breed's exact origin is unknown, but one belief is it began in ancient Egypt. Numerous Egyptian artifacts and writings show a dog that is undeniably a direct ancestor of the Pharaoh Hound. The dogs were used to chase and hunt small game and were also a loyal companion of the royal pharaohs of ancient Egypt. It is believed that the Phoenicians brought the dogs from Egypt to the Mediterranean islands of Malta and Gozo. The dogs are now the national dog of Malta, declared in 1974. For 2000 years the people of Malta were exclusively responsible for developing and preserving the breed into the Pharaoh Hound we know today. In Malta the hound is known as the Kelb Tal-Fenek, which literally translated means "dog of the rabbit," which was the dog’s main task. Just like his Mediterranean cousins, the Ibizan Hound, the Cirneco Dell Etna, the Portuguese Podengo and the Podenco Canario, the Pharaoh Hound is both a sighthound as well as a scent hound, using its sense of smell to a marked degree when searching for its prey. When the prey bolts, its sighthound instincts come into play and the hound is in full flight in strong pursuit. The breed is also a good guard dog. It has been used to accompany goats and sheep on their way to the pasture and as a gundog to flush and retrieve quail and woodcock. Maltese Lira coins were minted in 1977 depicting the Pharaoh Hound on the back side. 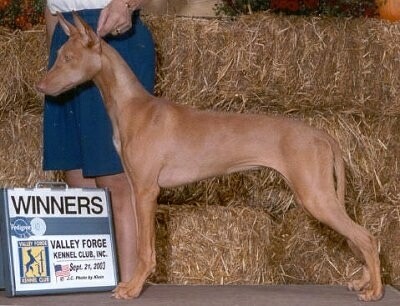 During the 1960s Pharaoh Hounds were imported to England and to the United States. 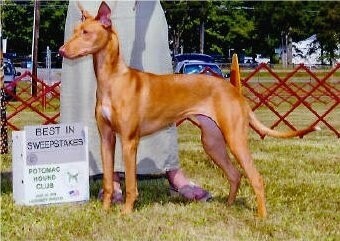 The breed was recognized by the AKC in 1983.